ramnaumiRama-katha is endless. Sankarsana (Lord Anantadeva) himself continuously sings the glories of Shri Rama, but even with unlimited mouths he is unable to touch the end in any way. We can just relish, and pray that these infinite pastimes may appear in our heart. Tulasi dasa has written Rama-caritra-manasa, which is based on Shri Valmiki's Ramayana. All the pastimes written by Tulasi dasa come from the Ramayana and other Puranas, but the principles of bhakti that he gave there have been taken from Shrimad-Bhagavatam. He presented important selected verses, especially from the eleventh canto, and translated them into Hindi poetry. Some people consider Tulasi dasa to be a mayavadi, but this is not correct. If we study Rama-caritra-manasa carefully, we can see that Tulasi dasa has written down the same principles that are in Shrimad-Bhagavatam. God is personal, the living entities are His parts and parcels, and our eternal constitutional position is to serve Him with love and affection. Another important point is that Tulasi dasa could not have written Rama-caritra-manasa unless he truly saw all these pastimes of Rama. Just as Valmiki received the mercy of Narada Muni, similarly, when Tulasi dasa sat down in trance, all the pastimes came into his heart. He has certainly received the mercy of Vyasadeva. Only by Shri Vyasadeva's mercy could he have written these pastimes. The main topic of this class is 'anyavilasita sunyam,' freedom from desires other than the desire to please Krishna. Bharata and Satrughna had gone to their maternal uncle's place, and upon returning to Ayodhya, they noticed that all was silent. Usually the city was cheerful and so many activities were joyfully taking place, but now it was like a lady whose husband is dead and who wears no decorations or ornaments. Seeing these and other inauspicious omens, Bharata and Satrughna became fearful. When they entered the royal palace and went to Kaikeyi's chamber, they were stunned to hear how Rama had gone to the forest for fourteen years and, because of that, their father had died of a broken heart. When Bharata heard this news and the reason for it, he became completely inimical towards his mother. From his heart he disconnected his relationship with her, and because of his pain and shock, he spoke harshly and abandoned her. Here is a very important lesson for all who are practicing bhakti. We hear the sloka beginning "anyavilasita sunyam," and we can very critically look into our hearts and consider, "What am I doing? Am I trying to serve Krishna in the way my mind likes to serve Him?? It is a subtle difference, because the mind is very tricky. If we fail to distinguish between these feelings, then anyavilasa, material desires, will cover our bhakti and there will be no way we can advance. Today, about ninety-nine percent of the devotees are like this. Some do it willfully, and some fail to distinguish the difference. If Gurudeva asks them to do something which is not pleasing to their own mind, they get angry or annoyed with him. That is prevailing in the majority of cases. We have to very carefully observe this and try to kick out this anyavilasa. Bhakti is not so cheap. We are trying to attain that love which controls both Shrimati Radhika and Krishna, but we must understand what price we have to pay for this. We have to give up everything we consider to belong to us. We do not have any separate existence of our own. The feeling of unconditional, unalloyed surrender is so deep that we become one with the mood of Gurudeva. Then, within our hearts, all aspirations are no longer our aspirations. They are Gurudeva's aspirations, or those of Hari, Guru, and Vaisnava. This is the state we want to achieve, and unless we attain it, there is no way to advance in bhakti. Whatever position we want to achieve in eternal Vraja, we have to start practicing here with Gurudeva. We have to apply this verse, anyavilasita-sunyam. Shrila Bhaktivinoda Thakura has written: "I have happily mixed all my desires in Your desires. My desires follow Your desires. There is no difference. They do not go even to a small degree in a different direction. They are completely in line with Your desires." This is what we want. Mirabhai wrote a letter to Tulasi dasa about her circumstances regarding her performance of devotional activities for Krishna. Her family, and especially her husband, the Rana of Mewar, were unfavorable. He would always suspect that she had some illicit connection with a man, but she was absorbed in the love of Giridhari. She wrote, "I cannot tolerate it any more. They are torturing me. They have given me poison, they have tried to have me bitten by a snake, and they insult me. Please guide me." Tulasi dasa wrote this verse to her, and though he did not instruct her specifically, she understood his message. One day she was deeply absorbed, dancing and singing in kirtana behind closed doors, with Giridhari there. The King heard her singing in great jubilation, and he also heard someone playing a flute. With great anger, his sword in hand, he tried to enter the room, but she did not hear him. 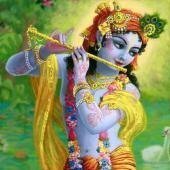 Krishna was playing the flute, so how was it possible for her to have any external consciousness? When the king entered,he saw that no one else was there with her, and Mirabai had fainted. He looked everywhere for the man who was playing the flute. Somehow or other he revived Mirabai, and he asked her with harsh words, "Where is that man you have hidden here?" Mirabai said, "You cannot see Him? He is standing right there." "I cannot see him," he said. Then Mirabai mercifully placed her hand on his eyes and,by the touch of her fingers, the Rana was able to see the three-fold bending form of Krishna playing the flute. Now taking darsana, he was humbled, and he also fainted. In the meantime, Krishna disappeared, and when the Rana returned to consciousness, he so much repented. Lamenting, he fell at the feet of Mirabai and again and again begged for forgiveness. He said, "I was so offensive and foolish." Because she had suffered so much, she had no reaction to his words. She had made up her mind that she must go to Vrndavana. She explained that what had happened had happened, and nothing could stop her now. Chanting, "Giridhari Gopal," she left for Vrndavana. There she met Shrila Jiva Gosvami and he took gopal-mantra from him. Was she a real disciple of Jiva Gosvami? No, she was a half disciple, because she ended up in Dvaraka. She said, "I only see Krishna. I don't see anyone else." Her vision was not so broad that she could see the gopis. She failed to accept the guidance of the gopis, and for that reason she could not get any position in Vraja. She went to Dvaraka, and there she entered into the Deity of Dvarakadisa and never came out. This is a very important point for those who want the service of the Divine Couple in Vraja, but who think they can achieve it by following all the principles of vaidhi-bhakti.They are meditating on Dvaraka-lila, and yet they want the service of Radha-Krishna in Vraja. Because they have such meditation, they will not get a position in Vraja. [For more information about Rama, Laksmana, Bharata, and Satrughna, see Shrimad-Bhagavatam 9.10].